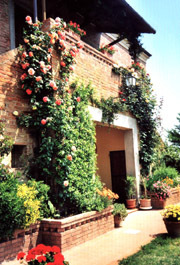 Edera apartment is located in the centre of Italy, in Tuscany, in the Commune of Montepulciano, in the province of Siena just halfway between Florence and Rome. 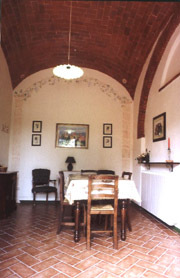 It is in restored farmhouse, built in 1878. In the apartment/suite “EDERA” can sleep two people in a double bed or on request two twin beds. Decorated in green with a big Trompe l’oeil painting in the bedroom that gives the impression of being in the Tuscan countryside. a fully equipped kitchenette, with a gas stove top that has different sized elements, so you could pick one to suit the pot and not flames leaping up the sides; fridge, microwave oven, American Style Coffee machine, toaster and the table could be extended. a bedroom with matrimonial bed (or possibility to have two twin beds), ceiling fans and a writing-desk where you can write your post cards. a large bathroom with Jacuzzi hydro massage tub, separate shower, hair dryer and double washbasin. Take the A1 motorway (Autostrada del Sole) towards Florence until the exit “CHIUSI-CHIANCIANO T.”.After the toll plaza, turn right and follow the signs to Montepulciano and Siena. After travelling approximately 5 Km. Turn left towards Montallese. Here follow the indications for “Sinalunga -Siena” and go straight on.You will go through 2 small villages: Tre Berte after 4 Km and Salcheto after 2 more Km. 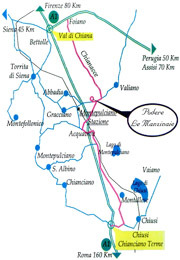 At Acquaviva (2 Km later) drive through and follow the sign to Valiano which is approximately 2 Km after Acquaviva.